The introduction uses a summary paragraph to outline their career. Their experience includes positions as a Clinical Nurse and a Staff Registered Nurse. 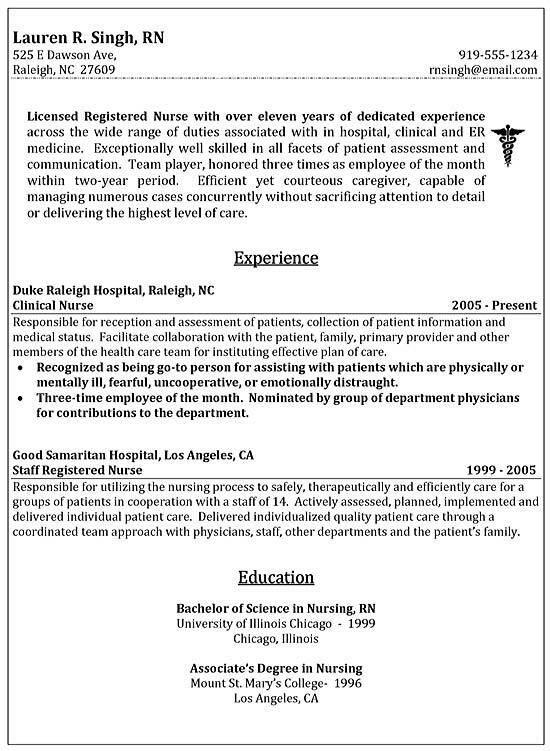 The job seeker emphasizes quality of care and efficient handling of patient care. The writer notes strong connection with other staff. They were also recognized for being highly efficient in dealing with troubled patients. The experience section uses standard headings. The paragraph section outlines responsibilities. The bold bullet points highlight achievements and awards. The education section lists an Associate’s Degree in Nursing and a Bachelor of Science degree in Nursing. Manage patient care and triage of outpatients for large clinic and hospital. Monitor, diagnose and detects patient health problems and respond by taking appropriate actions to prevent potential complications. Care for wounds, cuts, blisters and abrasions with first aid, cleaning, sutures and bandaging. Assess patients to identify physical, psychological and environmental needs. Oversee check in, status and processing of transfers and admissions. Schedule appointments, manage nursing supplies and oversee maintenance of devices. Assist doctors and health care teams on specialty care or surgeries. Provide support on call nursing staff with telephone medical assistance. Coordinate LVN care, lab operations, scans, MRI’s, EKG’s and other testing procedures. Maintain open and transparent communications with patient family members and provide support for continuous care upon release from hospital.